1Program in Biotechnology, Faculty of Science, Maejo University, Sansai, Chiang Mai-50290, Thailand. 2School of Renewable Energy, Maejo University, Sansai, Chiang Mai-50290, Thailand. 3Energy Research Center, Maejo University, Sansai, Chiang Mai-50290, Thailand. The utilization of renewable energy is significantly increasing, together with energy security concerns, efforts to mitigate the environmental impact of fossil fuels, and upgrading in living standards and renewable technologies. Biogas from anaerobic digestion of microalgal biomass is a renewable energy resource. The aim of the present study was cultivate the newly isolated and identified microalga, Botryococcus braunii through inexpensive red Nile tilapia effluent medium (RNTEM). Algae growth was monitored by optical density measurement. The N and P removal efficiencies and the productivity of B. braunii were determined. The cultures steadily increased throughout the cultivation period using with RNTEM; and successful culture was established under light intensity of 51 μmol-1m2sec-1 and room temperature. Elemental composition of algal biomass was used for estimate the theoretical methane yield. In addition, B. braunii biomass is a potentially valuable fermentation substrate, and produce over 65% of methane gas. The laboratory results obtained in the present study proved the production of algae by the RNTEM is potentially feasible and a powerful growth medium. Renewable fuels for alternative energy sources have been paid a great attention in recent years. Biofuel is a renewable energy, which may be instead of the fossil fuel resources in the future with decreasing of the fossil fuel on a daily basis . Biofuels have great potential as low-carbon transportation fuel alternatives and can be essentially drop-in fuels for existing fossil-fuel-based transportation infrastructures . Furthermore, bioenergy should play an essential part in reaching targets to replace petroleumbased transportation fuels with a viable alternative, and in reducing long-term carbon dioxide (CO2) emissions, if environmental and economic sustainability are considered carefully . The world continues to increase its energy use, brought about by an expanding population and a desire for a greater standard of living . Biogas is a renewable gaseous fuel. It is generated by anaerobic digestion (AD) of organic wastes. AD approaches steadily growing role in the renewable energy mix in many countries. AD is the process by which organic materials are biologically treated in the absence of oxygen by naturally occurring bacteria to produce ‘biogas’ which is a mixture of CH4 (40-70%) and CO2 (30-60%) with traces of other gases such as hydrogen, hydrogen sulphide and ammonia; the biogas process also produces potentially useful by-products in the form of a liquid or solid ‘digestate’ . For biogas production, various process types are applied which can be classified in wet and dry fermentation systems. Most often applied are wet digester systems . Chiu et al. revealed that using wastewater for microalgal cultures is beneficial for minimizing the use of freshwater, reducing the cost of nutrient addition, removing nitrogen and phosphorus from wastewater and producing microalgal biomass. Some components in the wastewater, such as nitrogen and phosphorus, are useful ingredients for microalgal cultures. Microalgae strains, B. braunii and Chlorella vulgaris were cultured in urban wastewater as monoalgal cultures and together in co-cultures . Several studies were reported B. braunii grown on wastewater medium successfully [9-11]. Fish farms produce large amounts of wastes, including dissolved inorganic phosphorus and nitrogen . The present study assessed the production of freshwater microalgae B. braunii cultured in wastewater effluent of Tilapia. Algal biomass contains considerable amount of biodegradable components such as carbohydrates, lipids and proteins. In the perspective of bioenergy production with microalgae it has been suggested that residual algal biomass should be converted into biogas via AD . Although research in the ?eld of microalgae as substrates for biogas production is reported in the literature [3,5,14,15], recent theoretical calculations [3,5,16] indicated their potential. The green alga, B.braunii is believed to represent one of the most promising sources of biofuels . The objective of this research article is to present the applicability of B. braunii culture through inexpensive red Nile tilapia effluent medium, biomass production for biogas estimation purposes and to determine the effectiveness of methane fermentation. The methodology was illustrated in Figure 1. Continuously stirred tank reactor (CSTR) was taken as the standard reactor. The lab-scale CSTRs were set up in the plant physiology and technology laboratory, program in biotechnology, Maejo University, Chiang Mai, Thailand. Figure 2 shows the schematic diagram of the microalgal cultivation system. The algae were grown in triplicate reactor system with the 10 day detention time period, for 28 days with the fed-batch in 4 L under room temperature with illuminated through fluorescent lamps and light intensity was 51 μmol-1 m2 sec-1. All the reactors of feed and other operational parameters were listed in Table 1. For the fed-batch cultivation, the fed-cultivate solution was fed at the rate of 400 mL day-1 without adding extra CO2. The reactors were illuminated with the fluorescent tube panels with a 16:8 h light and dark cycle. Figure 1: Flow chart of methodology. Figure 2: Photobioreactor. 1) Inlet 2) Outlet 3) Stirrer 4) Hot plate stirrer and 5) Gas exchangeable sponge with atmosphere. The procedures of isolation and identification of microalgae was adopted from previous studies [1,4,18]. Microalgae were collected by plankton net (20-μm pore size) from fish pond (18° 55′ 16″ N; 99° 0′ 58″ E) at Maejo University, Thailand. The collected samples were samples of about 5 ml were inoculated into 5-ml autoclaved Bold Basal Medium (BBM)  in 20-ml test tubes and cultured at room temperature (25°C) under 45 μmol-1 m2 sec-1 intensity with 16:8 h photoperiod for 10 days. After incubation, individual colonies were picked and transferred to the same media for purification in 250 mL conical flask. The culture broth was shaken manually for five to six times a day. The pre-cultured samples were streaked on BBM mediumenriched agar plates and cultured for another 10 days with cool white fluorescent light using the same light intensity. The single colonies on agar were picked up and cultured in liquid BBM medium, and the streaking and inoculation procedure was repeated until pure cultures were obtained. The purity of the culture was monitored by regular observation under microscope. The isolated microalgae were identified microscopically using light microscope with standard manual for algae [20,21]. Isolated and purified microalgae, B. braunii were inoculated in 250-ml Erlenmeyer flasks containing 125 ml culture medium (BBM). Flasks were placed on a reciprocating shaker at 120 rpm for 7 d at room temperature of 25±1°C. Light was provided by cool white fluorescent lamps at an intensity of 45 μmol-1 m2 sec-1. The algae culture was then transferred to 500-ml Erlenmeyer flasks containing 450 ml. The growth of B. braunii was measured by a spectrophotometer (Spectronic Genesys 20, Thermo Fisher Scientific) at 665 nm. Red Nile tilapia culture effluent was collected from the faculty of Fisheries Technology and Aquatic Resources, Maejo University near the laboratory was used as a substrate to cultivate B. braunii; fish pond shown in Figure 3. Pre-treatment was carried out by sedimentation and filtration with a filter cloth to remove large, non-soluble particulate solids. According to our previous study , after filtration the substrate was autoclaved for 20 min at 121°C, after which the liquid was stored at 4°C for 2 days for settling any visible particulate solids and the supernatant was used for microalgae growth studies. 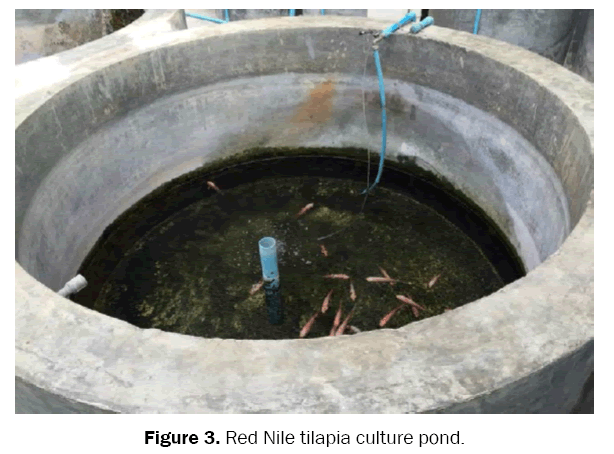 Figure 3: Red Nile tilapia culture pond. The growth rate of the B. braunii was determined from the measurement of the optical density. Since UV–vis spectrophotometric optical density (OD) is the most commonly-used technique for estimating cell concentration in liquid culture . Also OD can be used as a timely and indirect measurement of the increase in microalgal biomass in the cultivation medium over time. The growth was spectro-photometrically measured at optical density of 665 nm (Spectronic Genesys 20, Thermo Fisher Scientific). where Co and Ci are the nutrient concentrations in the initial wastewater (medium) and the culture filtrates (mg/L), respectively. The analysis of elemental composition (carbon, hydrogen, and nitrogen) was made by an elemental analyzer (Perkin−Elmer Mode1 2400) and the content of oxygen was calculated by difference; O = 100 − (C + H + N). The amount of biogas produced is closely related to the elementary composition of the biomass. Biogas estimation method was adopted from previous studies . All experiments were determined in biological triplicate to ensure the reproducibility. Experimental results were obtained as the mean value ± SD. Statistical analyses were performed using the SPSS statistical package (SPSS Inc., Chicago, IL, USA). The statistical significances were achieved when p<0.05. A variety of algae species have been studied using a primary/secondary effluent as growth medium. Assessed variables range from growth rate, biomass productivity, chemical composition, chlorophyll production, biodiesel, biohydrogen, biogas and others [1,2,4,5,18]. In addition, aquaculture effluents have been assessed in a continuous photo-bioreactor or in outdoor conditions culturing micro/macroalgae [22,23]. Pillay  stated that effluents from intensive fish farms are enriched with solids and dissolved nutrients. This study was conducted to assess the potential of cultivating B. braunii using Nile tilapia effluent as a nutrient medium. The nutritious and physiochemical characteristics of red Nile tilapia effluent medium (RTEM) presented in Table 2. Table 2: Characteristics of red Nile tilapia effluent medium. For algae production, biomass measurement generally has many methods such as direct measurements by dry weight of gravimetric biomass itself and indirect measurements (Chl-a, b, a + b, c, d, cell count, Secchi disks and turbidity) [25,26]. Growth estimation by optical density measurement is the easiest method. Furthermore, OD is used as a convenient indirect measurement of biomass concentration in microbial cell suspensions. Since the optical density had a good correlation with algal density in previous studies . The OD method has several advantages, one of them being that this method is involving less technique and time. Culture growth of B. braunii growth was determined by measuring the values of OD 665 nm with a spectrophotometer every day (Figure 4). The absorbance of B. braunii cultures steadily increased throughout the cultivation period was presented in Figure 1. Figure 4: Optical density of Botryococcus braunii. Generally, microalgae have excellent adaptability to various environments and can grow almost everywhere [26,28]. Environmental factors affect closely algal growth because of their physiological requirements and nutrient availability is a key factor regulating the main physiological responses of microalgae. Carbon is a fundamental element in microalgae cells, accounting for approximately 50% of microalgae biomass . The CSTR with ideal mixing could optimize algae to access nutrients and to uptake dissolved inorganic carbon easily . Pittman et al. revealed that microalgae can be efficiently used to remove significant amount of nutrients because they need high amounts of nitrogen and phosphorus for protein (45-60% of microalgae dry weight), nucleic acid and phospholipid synthesis. For the successful algal growth, the nutrients were intrinsic requirement such as carbon (C), nitrogen (N) and phosphorous (P). Nutrients such as C, N and P are the main ingredients in the algae culture medium [25,26,28]. The nutrient removal efficiency of B. braunii was analyzed, and in this study the efficient algal utilization of macro nutrients of nitrogen and phosphorus led to effective removal of nitrogen and phosphorus up to 74% and 91% from the respective pools. In other words, the present system was steadily increasing growth rate. Consequently, RNTEM contains high concentration of C, N and P, which has great potential to be used as an alternative to the conventional culture medium in algae cultivation. Microalgae are the dominant primary producers in most aquatic habitats. They represented a diverse group of microscopic prokaryotic and eukaryotic photosynthetic organisms of tremendous ecological importance, because they were the beginning of the food chain for other animals [1,2,8,26]. Microalgae are highly productive and are able to produce large quantities of biomass more efficiently than current cultivation practices for terrestrial crops. Most algae were photoautotrophic, converting solar energy into chemical forms through photosynthesis [18,25]. The photosynthetic efficiency of microalgae in engineered systems can reach 4–5% of the solar energy compared to 1–2% for terrestrial plants. According to numerous studies, the main bene?ts of using algae for bioenergy production are the following: (1) they consume less water for growth than terrestrial crops and can be cultivated in saline water, brackish water or wastewater; (2) they can be cultivated in non-arable lands and, therefore, without competing with food crops; (3) they can contribute to carbon dioxide mitigation, since they may grow in high CO2 concentrations from coal-?red power stations; and (4) they have a high photosynthetic efficiency compared to terrestrial crops, which may lead to high productivities [25,26,28,31,32]. AD of microalgae is a prospective environmentally feasible option for creating a renewable source of energy for industrial and domestic needs. Microalgae AD is a key unit process that integrates efficiency and beneficially into the production of microalgae derived biofuels. AD culminating in methane fermentation improves the economic viability of microalgae liquid biofuel production and presents an opportunity for power generation from wastewater derived microalgae. AD of phytoplanktonic cells is a process which takes place naturally in aquatic environments. When algal cells sink towards the anoxic and aphotic zones, they eventually die and break up. Nutrient remineralization in these anoxic layers of aquatic environments is a key process, responsible for recycling nutritive elements . AD of microalgae is a prospective environmentally feasible option for creating a renewable source of energy for industrial and domestic needs. Algal AD on is a key unit process that integrates efficiency and beneficially into the production of algal derived biofuels. Microalgae are suitable renewable substrates for the AD process. The process of biogas production from algal biomass; moreover, AD can be integrated into other conversion processes and, as a result, improve their sustainability and energy balance. Opposite to biohydrogen, bioethanol or biodiesel that only uses determined macromolecules (carbohydrates and lipids), biogas is produced by biological means under anaerobic conditions that converts all algae macromolecules into methane [2,4]. Anaerobic digestion is a collection of processes by which relevant bacteria convert biodegradable organic materials into biogas under anaerobic circumstances through four different stages (Figure 5) - hydrolysis, acidogenesis, acetogenesis and methanogenesis [4,5]. These stages are involved in the breakdown of organic matter on the path to methane production; stages include hydrolysis, fermentation (or acidogenesis), acetogenesis and eventual methanogensis. Hydrolysis involves the conversion of complex molecules and compounds–carbohydrates, lipids and proteins–found in organic matter into simple sugars, long chain fatty acids and amino acids, respectively. Acidogenesis in turn converts these into volatile fatty acids, acetic acid, CO2 and H2. Acetogenesis converts the volatile fatty acids into more acetic acid, carbon dioxide and hydrogen gas. Methanogens have the ability to produce methane by using the carbon dioxide and hydrogen gas or the acetic acid produced from both the acetogenic or acidogenic phases [4,5]. Many elementary properties of biomass have been determined for a wide range of fuel types. These properties include physical size and shape, elemental composition (ultimate analysis), moisture content, proximate analysis, heating value, bulk density, specific gravity, thermal conductivity, and mechanical, acoustic, and electrical properties. Theoretical yield of biogas, calculated from the chemical composition of B. braunii (CcHhOoNnSs).When the C, H, O and N composition of a wastewater or substrate is known, the stoichiometric relationship reported by Buswell and Boruff  can be used to estimate the theoretical gas composition on a percentage molar basis. where Vm is the normal molar volume of methane. Table 3: Elemental and proximate analysis of the B. braunii. Eq. (1) is a theoretical approach that allows estimation of the maximum potential yields. Using Eq. (1), it is possible to compute a theoretical specific methane yield. Composition of methane and biogas production from B. braunii details were presented in Table 4 (by dry weight basis). Table 4: Composition of methane and biogas production from B. braunii. The biogas composition of carbon dioxide (31.46%) and methane (65.92%) of was estimated from the biogas. The carbon, hydrogen, nitrogen, oxygen and sulphur contents of were in B. braunii , 73.4%, 10.8%, 2.3%, 13.2% and 0.17% respectively. The methane content of the biogas from B. braunii and other microalgae data was presented in Table 5. And results revealed that B. braunii methane content was higher compared with other microalgae also cultured system such as monoculture and mixed cultures of algae. Consequently B. braunii has plenty of nutrients for biogas production process; it is suitable to be used as energy crops for biogas production [35-38]. Table 5: Methane content of Botryococcus braunii and other microalgae. The freshwater green microalga, Botryococcus braunii species demonstrated the possibility of growing in red Nile tilapia effluent medium. The steadily increasing algae growth was observed throughout study period. Macronutrient removal was achieved through cultured in fed-batch mode using continuously stirred tank reactors. Elemental analysis was also performed using a CHNS-O analyzer for biogas assessment. The major biogas composition of carbon dioxide (31.46%) and methane (65.92%) was estimated from the B. braunii . Consequently, fast growing, high-yielding and rich chemical composition of B. braunii was promising energy crops for biogas production.